South Dakota RV camping is hard to beat! Fabulous scenery, interesting history, and of course the faces on Mt Rushmore all await you. From RV resorts, to basic service public campgrounds, there is something for everyone in South Dakota. Free dispersed camping (boondocking) is available on USDA Forest Service administered lands. South Dakota RV Parks – Research tool for finding the best private South Dakota RV parks and campgrounds. National Park Service – NPS information about South Dakota RV camping in National Parks and other NPS administered lands. US Forest Service – USFS information about dispersed camping (boondocking) and developed campgrounds at the USDA National Forests and Grasslands in South Dakota. Bureau of Land Management – BLM information about the very limited South Dakota RV camping locations and dispersed camping rules. US Army Corps of Engineers – USACE/COE South Dakota RV camping information about Corps managed lakes and campgrounds. State Parks – RV camping is available throughout South Dakota's beautiful state park system. Division of Wildlife – South Dakota has many developed campgrounds associated with wildlife and fishing areas. Official State Tourism Website – Where to go, and what to do. Includes South Dakota RV camping suggestions and trip planning ideas. RVDumps.com – Places to dump in South Dakota. Sanidumps.com – South Dakota RV dumps listed by town. South Dakota Camping Location Maps – Map of public campgrounds across South Dakota. This map shows only a few of all free and low cost camping locations available. Map features can be zoomed in, and panned for exact location. Free overnight camping, or $5 for electric hookup at either of Arlington City Parks. 10 miles east of town in Buffalo Gap National Grassland. French Creek Campground offers vault toilets and fire pits. The Lacreek National Wildlife Refuge allows free camping in designated areas. This Lacreek NWR Map shows the designated camping area. 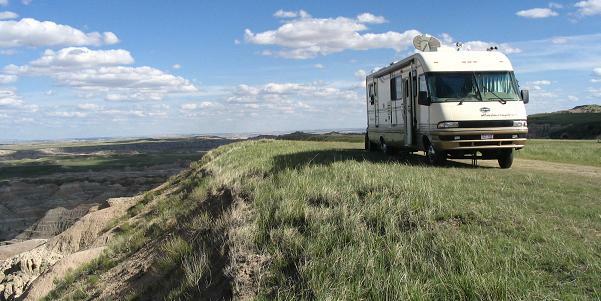 Free RV camping is allowed a few miles south of Wall on National Grassland managed lands. This free dispersed camping (boondocking) location is one of our Featured Campgrounds. The Wall RV Camping Location has maps, directions, and photos of this great free South Dakota RV camping location. South Dakota RV camping is great for RVers looking for varied outdoor experiences. Campgrounds managed by the National Park Service, BLM (Bureau of Land Management), USFS (US Forest Service), and South Dakota State Parks offer great RV camping locations. Amenities range from dry RV camping with only trash and pit toilets to RV camping sites with full RV hookups. This is only a sample of public South Dakota RV camping opportunities. Richmond Lake Recreation Area offers RV camping, boating, fishing, wildlife viewing, and hiking. Electric and non electric campsites. Custer State Park is a popular South Dakota RV camping destination. All types of outdoor recreation opportunities are available. Camping reservations are available. Wind Cave National Park has first come first serve RV camping. No hookups but numerous pull thru campsites. Water and flush toilets during warmer weather then vault toilets and no water in winter. Two campgrounds with different personalities are available at Roy Lake State Park. Sandy beaches, picnic areas, boat rams and a variety of hiking trails are available. Groceries, boat rentals and more. The Llewellyn Johns Recreation Area is a small park with fishing, hiking, and wildlife viewing. 10 electric RV camping sites available, water, and vault toilets. A limit of 5 free days of camping are available at Have-A-Rest municipal campground. Water, electric, fishing, boat launch and playground. The BLM managed Ft Meade Recreation Area offers two designated camping locations. Low cost South Dakota RV camping in a historic area with picnic tables and vault toilets.